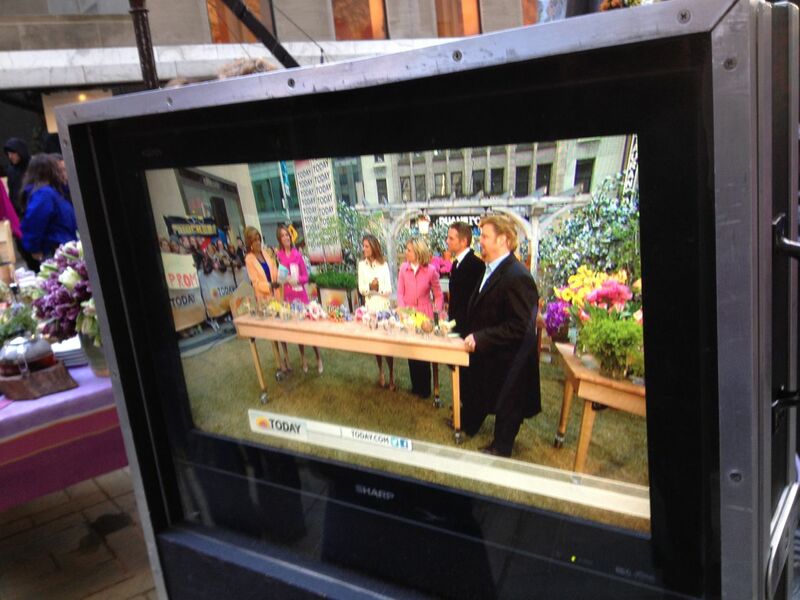 This week Ed was invited to do two segments on the Today Show for their “Spring Fling” as judge for a little friendly competition amongst the co-hosts. The first segment was matching bulbs to their real blooms and the other was teams of hosts making the best bouquet and Ed determined the winner. Sounds easy right? TV is so much smaller in real life! The studio is not nearly as big as what you think it is and their “green” room is really tiny. 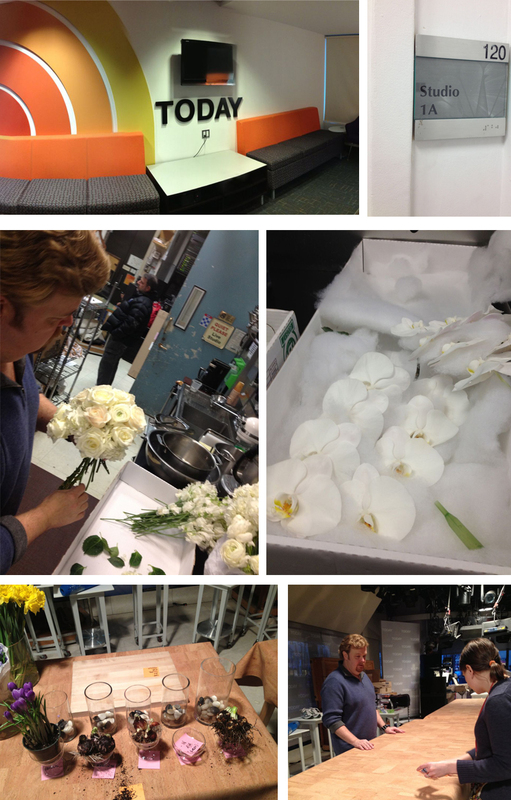 There was a lot of prep form Ed the night before his segment, we were in the Today Show kitchen making a wedding bouquet as well as the trophy for the winner of the challenges. The total time for both segments was 75 seconds. That’s right, I said 75 seconds. Do you know how long it took us to prepare for 75 seconds? It took 5 people (just on our end) and about 30 hours total to prepare for 75 seconds. It’s a lot of WORK. It looks really put together on television, but every little nuance of each segment is thought out. There were many emails that went back and forth between our office manager and Macy’s/Today Show (Macy’s invited us to do the segment because of our involvement with the flower show). 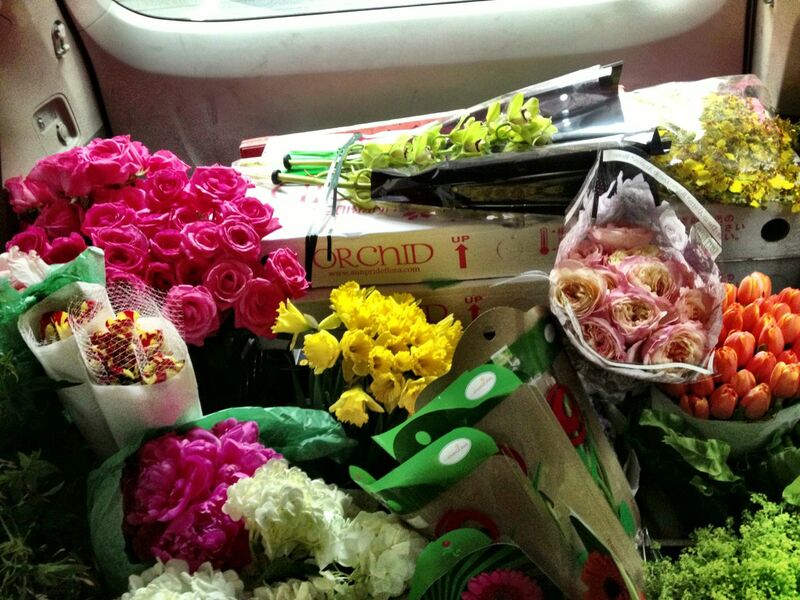 Then there was a few hours spent at the flower market picking out flowers. Even this part is well thought out, you want something that is going to “read” well on television and you want something big enough to see. Once the flowers were picked out, they were delivered to our studio where the flowers needed to be conditioned, but we didn’t have that kind of time, so we forced the flowers to do what we wanted. (There is a way to do this…perhaps another blog post?) 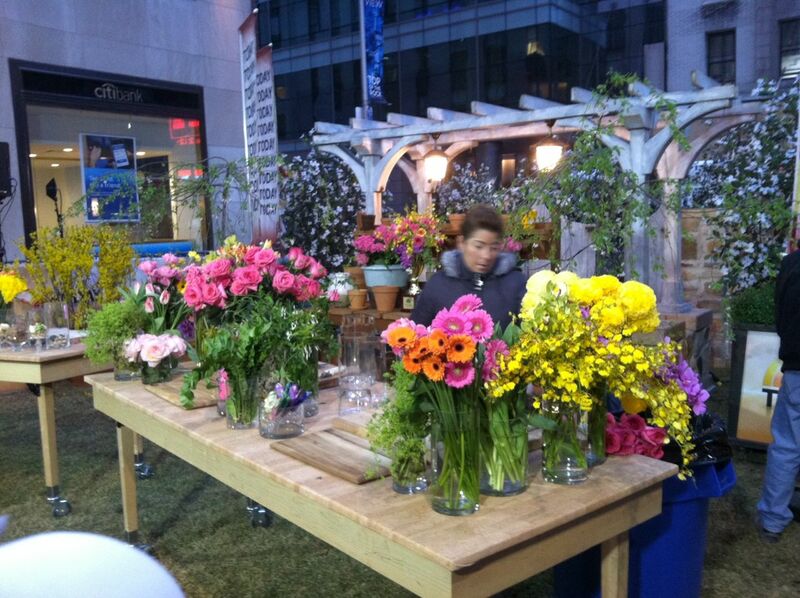 Typically you want a few days for the flowers to “condition”. Ed and I packed everything up and went to the set the night before the morning segment to set up with the producer and props director. It took Ed an additional 3 hours of flower arranging onsite to finish up. 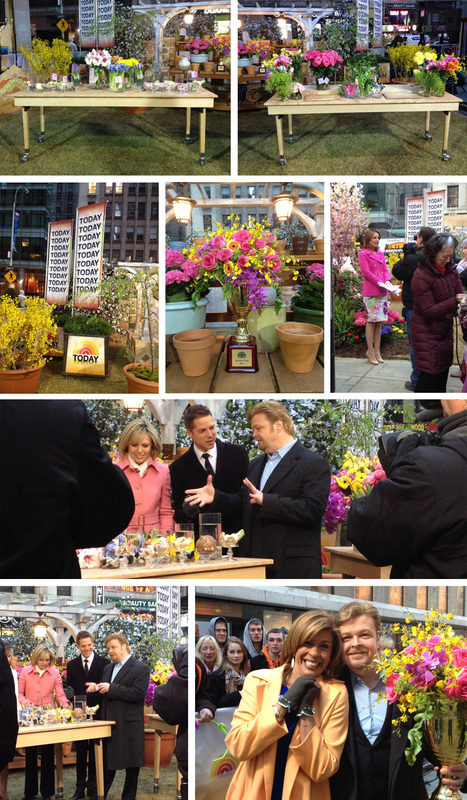 All of the flowers that we brought over to the Today Show studio. Needless to say our van smelled amazing! Like spring! Here I am on set doing some finishing touches cleaning some roses. We arrived on set at about 6:45am and I had some last minute things to do….like clean thorns off the roses so the co-hosts would not cut themselves. Once everything is in place and Ed went through hair and makeup, you wait. Ed was whisked away outside, put on set, cameras rolled, fun ensued and then it was done. If you missed the segment, you can watch it here. A job well done Ed Libby! Just like with a wedding cake – we would work for days and than it gets consumed in 75 seconds… But the memories do last forever! ← Look who I found?? ?